One of the most common complaints from hard of hearing people is that while their hearing technology helps them hear speech well, music “just isn’t the same.” This presentation will discuss why music is such a challenge for people with hearing loss as well as some real-world advice on how to take proactive steps to reduce frustration and make listening to music more enjoyable despite your hearing loss. 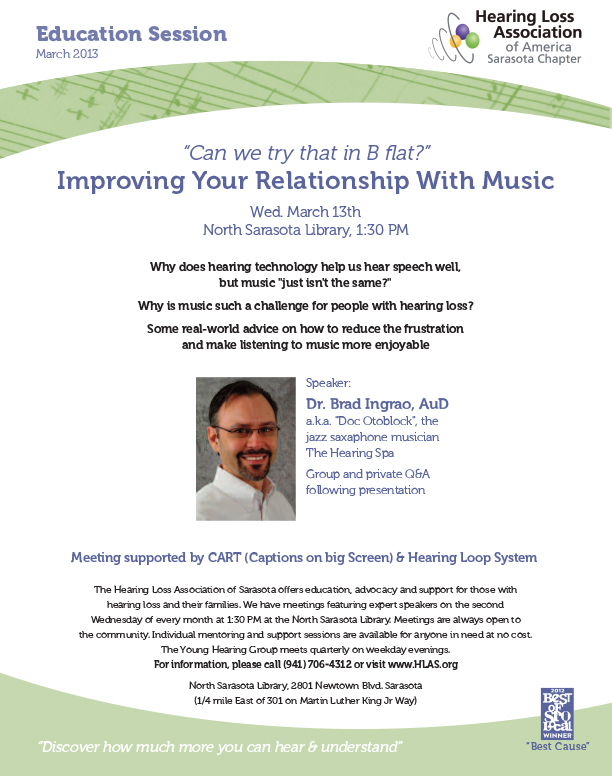 Dr. Brad Ingrao has been an audiologist for over 20 years and a musician for nearly 40. In addition to providing a full range of hearing aid and cochlear implant services at the Hearing Spa in Sarasota, Dr. Ingrao is a member of the Board of Trustees of HLA Sarasota, HLA Florida, a regular columnist in Hearing Loss Magazine and a frequent presenter for HLAA both at their National Conventions and online through their webinar series. Dr. Ingrao was inspired to become an audiologist by his late uncle who was forced to cut short a career in music when he lost nearly all of hearing, but reinvented himself as a caring and highly competent hearing instrument specialist, who after a 30 year retirement, returned to performing for the final years of his life. Please feel free to email or print and distribute to friends, family and local hearing professionals. ← February Issue of Listen Up!